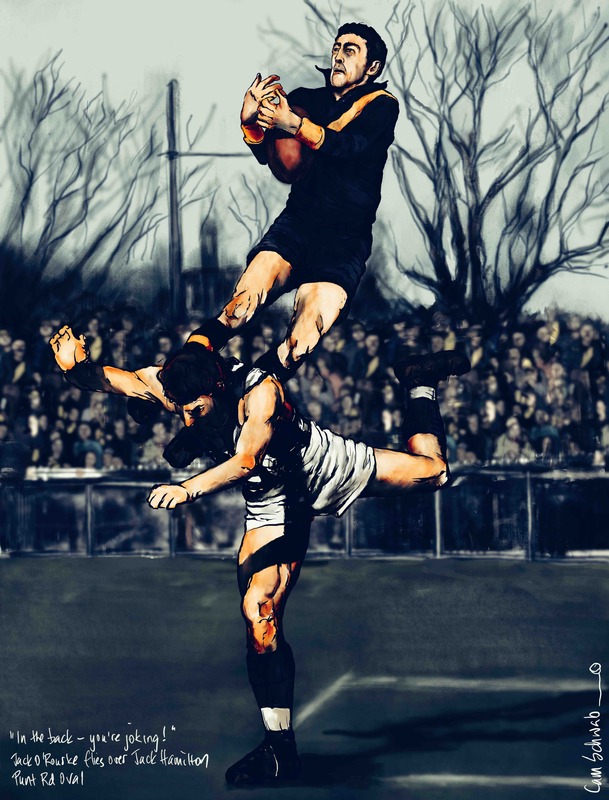 This is my drawing of Jack O’Rourke, a high-leaping Tiger full forward from the 1950s. This ‘mark’ was taken in the goal square at old Punt Road Oval, in the shadows of the Richmond railway station against the old enemy, Collingwood. But umpire Bill Barbour paid a free against Jack, in-the-back to his opponent, Collingwood full back and somewhat ironically, future AFL CEO Jack Hamilton. The original photo was taken on a box brownie camera and featured in a book I loved when I was a kid called ‘100 Great Marks’. I remember feeling a deep sense of injustice that Jack’s moment was ‘stolen’ from him, despite the fact that the authors of the book included his ‘mark’ as part of the celebration of this unique component of our game. Jack was somewhat of a raconteur, and if you asked him about the ‘mark, he would lean forward as if letting you in on a secret. He’d tell you that umpire Barbour sidled up to him during the game and acknowledged that he’d made a blue and should have paid Jack the mark. Knowing what I know about Richmond in those times, umpire Barbour was lucky to get out of the ground alive! Jack O’Rourke also loved to break into song, and had a terrific singing voice to back it up. His rendition of the Tigerland theme song was the best I’ve heard, particularly when surrounded by those with whom he shared the honour of wearing the yellow and black.